After using version 1.0 of this telescope for a number of years. I wanted to correct some flaws in the original design. 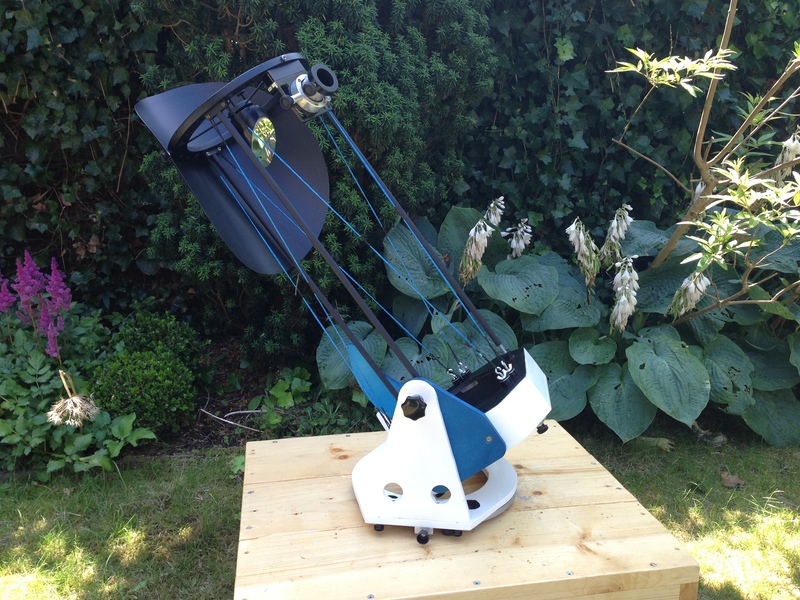 So in 2014 I rebuild parts of the telescope. The main problem with version 1.0 was that it took me about half a hour to setup the telescope. This was mainly due to the complex secondary ring and the collapsable alt-az base. Also the focuser was not up to par. The secondary ring of version 1.0 consisted of segments that were put together with small nuts and bolts. The new ring is a single piece out of 12 mm plywood that is reinforced with several layers of carbon. The new focuser is a rotating type and can be detached for transport. The new lightshield is made out of Kydex and is less prone to flapping around in windy conditions. When I designed version 1.0, I initially intended to use the mirrorbox for storing the secondary mirror, focuser and parts of the alt-az mount. Although everything fitted in the suitcase I was using for transportation, the mirrorbox was a little cumbersome. For version 2.0 I shortened the box by a few centimeters and added larger bolts for attaching the strings. I also added a small counterweight on the bottom of the box too balance the scope for larger eyepieces. Although the first mount was working perfectly well, it was a bit of a nightmare to assemble and disassemble. The new mount is much easier to take apart. I also has a slip mechanisme so I can vary the amount of drag on the azimuth.